With so much exciting innovation happening in smartphone technology, Augmented Reality (AR) and Virtual Reality (VR) are often confused, even though they have very different practical functions and uses. We've broken down the main differences so that you know the most important things about your new favorite phone features. Virtual Reality places you in a virtual, computer-generated world. This requires you to wear a headset, either placing custom built-in screens in front of each eye, or by using a VR-enabled smartphone like the ASUS ZenFone AR. The phone clips into the headset and presents your eyes with a split screen view that gives virtual reality its rich, 3D perspective. Apps can determine when you move your head in any direction using the accelerometer in your phone, and GPS locates you in the virtual reality you’re seeing. And with headphones, you can hear sounds as if they are coming from different directions, giving you a completely immersive experience and making you feel like you've been transported somewhere new. VR is a great technology for experiencing events and seeing places that you can’t physically get to. For example, it can be used for watching a virtual concert, walking through a distant museum, and visiting pretty much anywhere in the world. All this is made possible by Google’s Daydream platform. There are heaps of Virtual Reality apps in the Google Play Store, but if you want to ease your way in and experience VR for the first time, check out Google Cardboard which contains lots of demos and mini-games to help you find your virtual bearings for the first time. Now What Is Augmented Reality The ? Augmented Reality superimposes the virtual world onto the real one through a smartphone screen, such as the ZenFone AR, or through wearable tech such as Microsoft’s Hololens. Technically speaking, Augmented Reality projects content over the real world, whereas Mixed Reality content interacts with the real world. 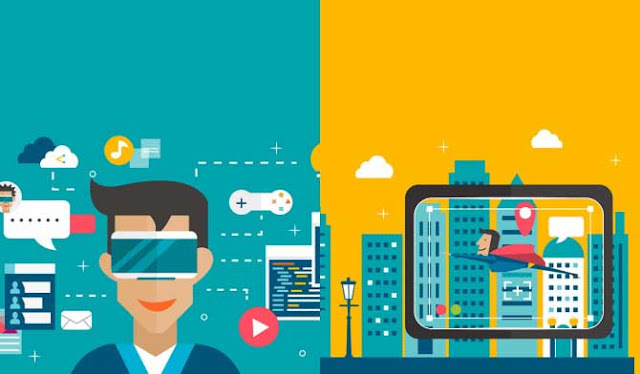 However, as these technologies become more popular, “Augmented Reality” is becoming a catch-all term for both augmented and mixed reality technologies. Google’s Tango platform supports AR experiences and refers to the set of sensors and computer vision software that enables AR apps. Essentially, the phone has to be able to “see” and understand spaces like humans do. To do this it must be able to track motion, perceive where it is in relation to the physical surroundings, and perceive depth. In terms of gaming, AR allows you to play with other people in the real world because you can see and interact with them. You can find a host of amazing apps to check out on the Google Play Tango Store, but perhaps one of the coolest apps is Dinosaurs Among Us, which brings incredible, 3D dinosaurs into your kitchen, office, or wherever else you want them. VR and AR are opening up a vast array of new experiences for technology lovers, so take the plunge and try it for yourself! So this is all about what you need to know about Augmented Reality(AR) And Virtual Reality (VR) Differences. If you like share it and have any query do comment below. Thank you for reading.